5 trees planted in memory of Paul Anthony Wulf Sr. 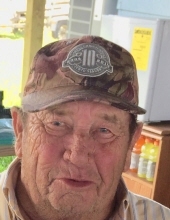 Celebrating the life of Paul Anthony Wulf Sr.
Obituary for Paul Anthony Wulf Sr.
Paul Anthony Wulf, Sr., 72 of Brazoria passed from this life in Houston on January 25, 2019. Paul was born in Hallettsville, Texas on July 2, 1946 to William & Lillie Wulf. A memorial service will be held at St. Joseph’s Catholic Church in Brazoria on Monday, January 28, 2019 at 11:00 am with Father Loc Phan officiating. A rosary will be recited on Sunday, January 27, 2019 at 6:00 pm also at St. Joseph’s Catholic Church. His grandchildren will be serving as honorary pallbearers and reading lecture. Left to cherish his memory are his wife of 48 ½ years, Barbara of Brazoria; children, Paul Anthony Wulf Jr. of Katy, Curtis William Wulf & wife, Cheryl of Arp, Veronica Harvey & husband, Damon of Sweeny, C. Diane Wulf & husband, Javier “J.P.” Valadez of Old Ocean, & Tammy Sanderson & husband, Brian of West Columbia; brother, Roger Wulf & wife, Donna of Berclair; sister, Barbara Janak & husband, James of Weimar; grandchildren, Travis Spates, Chelsea Adams, Ethan Adams, Riley Harvey, Corey, Skyler & Hunter Sanderson, Dylan Wulf, Jacob Valadez, Mariah Valadez, Bianca, Mckenzie, & Curtis Wulf Jr.; great grandson, Aiden Madrigal. Paul is preceded in death by his parents and sisters, Georgie Ann McElroy & husband, Fabian, Lovina Otto & husband, Wilbert, Rita Kansteiner, & Natalie Pitre. To plant a tree in memory of Paul Anthony Wulf Sr., please visit our Tribute Store. "Email Address" would like to share the life celebration of Paul Anthony Wulf Sr.. Click on the "link" to go to share a favorite memory or leave a condolence message for the family.